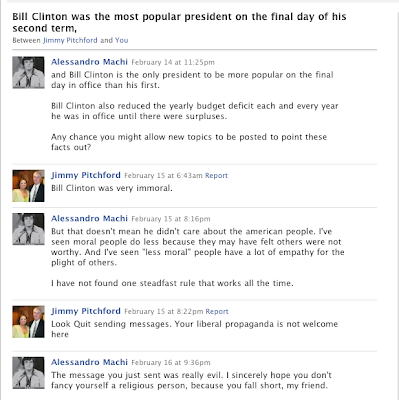 Daily-PUMA: CLINTON DERANGEMENT SYNDROME on DISPLAY at FACEBOOK hate group. CLINTON DERANGEMENT SYNDROME on DISPLAY at FACEBOOK hate group. I respect email communication with others. I feel it is important to respect the privacy of email communications. However, if someone misrepresents an email communication of mine to others, I will most definitely release an email to counter a lie. (It happened once several years ago in another place and time). I will also consider releasing a communication if I think someone has Clinton Derangement Syndrome; specifically to remind Clinton supporters that there are some haters out there and they will never change. I'm not asking anyone to hate this person, I simply want you to be aware that no matter what the Clintons do, there will always be people who hate them even though Bill Clinton had the highest approval rating of any president from the past 80 years and perhaps longer, on his final day in office. Bill Clinton is also the only president in the past 80 years or longer who had a higher approval rating on his final day in office than he did on his first day in office, meaning Bill Clinton trended upward over the course of his presidency. Granted, I went to this persons 1 million facebook haters against Hillary Clinton club, (which I am happy to report has lost a quarter million members) and asked them to reconsider their hate for Hillary Clinton. I truly believed we could have a civil discussion. Since that has turned out not to be possible, I thought you should see how quickly the communication turned hostile. The communications were not rapid fire, they were spaced over a few days time so responses could be measured.